Ethiopian Jewish community leader notes that despite reports that Aliyah has ended, dozens still arrive every month. Avraham Negosa, representative of the Ethiopian community in Israel, revealed to Arutz Sheva on Sunday that Aliyah from Ethiopia still continues - despite reports to the contrary. "When they celebrated six months ago, saying Aliyah from Ethiopia had ended, it was both a mistake and misleading," Negosa stated. "We are happy that [mass] Aliyah has ceased, but in practice there are thousands more, in Gondar and in Addis Ababa." According to Negosa, dozens of Ethiopians still arrive on a monthly basis. "We are not surprised [to hear] that the Jewish Agency and Ministry of Absorption have thousands more [Ethiopian Jews] waiting to immigrate," he said. "Dozens more immigrate monthly - little by little - but Aliyah [from Ethiopia] continues." Negosa speculated that the official announcement that Aliyah from the heart of Africa had ended was to delegitimize Ethiopian Aliyah. "I do not understand their motives," Negosa noted. "The facts clearly prove otherwise. It's illogical to bring children to Israel and leave behind parents or siblings. The Appeals Committee of the Ministry of the Interior visited in December and saw the intensity of the tragic situation there - we hope their suffering will end soon." The Ministry of Interior issued a response stating that Aliyah en masse from Ethiopia has ended, in accordance with a November 2010 decision; as of now, Aliyah from Ethiopia is like making Aliyah from any other country - in individuals or small groups, but not in special mass-Aliyah operations. Most Ethiopian Jews left for Israel in two major operations organized by the State of Israel: Operation Moses in 1984 and Operation Solomon in 1991. Many traveled hundreds of miles by foot before being airlifted by the Israeli government, escaping poverty and anti-Semitism in Ethiopia, and fulfilling their community's dream of returning to the Jewish homeland. While those initial waves of Aliyah were from the Beta Israel community, which had preserved Jewish traditions and law (Halakha) over thousands of years, subsequent olim hailed from the "Falash Mura" community - descendants of Jews forcibly converted to Christianity in the 19th and early 20th centuries. As a result of their status, their Aliyah under the Right of Return for Jewish exiles has been a contentious issue, although most authorities accept they are descended from the Beta Israel. 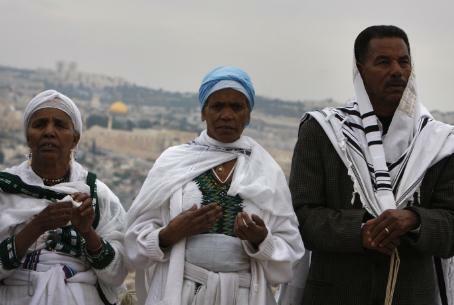 Some 120,000 Ethiopian Jews and their descendants live in Israel today.